Carbon transfert is surely one of the most beautiful photographic print techniques invented by men. This article traces the history of its invention and describes the unique characteristics that made it the king of the print techniques. There’s also a technical introduction to the process and a succinct bibliography. At the beginning photography produced unstable images. Just think about the first pictures printed on salted paper by Fox Talbot since 1841, when there wasn’t an adequate fixing bath yet. Later on, numerous processes were activated, such as protective gold or selenium toning, that still are in use today to preserve analogical pictures. But stability in time still was the weak point of photography. 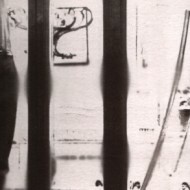 Palladium or platinum print and carbon print were two of the most stable and beautiful techniques of the entire history of photography that the researches for the problem we talked before found. Even if the first carbon print patent date back to 1855, the image only contained shadows, lights were completely washed away. After the well-known remarque de Fargier about the hardening deepness of the gelatin and the invention during the following years of the image transfer, the carbon print technique was patented in 1865 by Joseph W. Swan, under the form we still use nowadays. The prints obtained with this method solved the problem of the stability and moreover had an extraordinary fine and defined image. Amazing when one thinks that they were produced only with animal gelatin and powdered carbon. Therefore, the carbon print knew a great success and was considered more and more the best technique print ever. It has been largely used till the fifties, when its industrial production stopped completely. Today, printing with this technique means build all the material with your own hands, and unfortunately the complexity of the procedure limits its diffusion. Carbon prints are absolutely the most stable. They’re not made of a metallic deposit, which can be attacked or oxidized, but made of a pigment, simple carbon dust at its origin, watercolor or tempera nowadays. Those pigments derive from some kind of grounds and therefore are completely inactive. Photography history has less than a couple of centuries and all the questions about the conservation of the image on the really long term are still open. Antique paintings and cave art survived through millenniums, so carbon prints, manufactured with the same ingredients and pigments, should have long life. All of the great silver chloro-bromides fiber paper printers know that the glossy paper valorizes shadows and produces more intense blacks. At the same time though, high, finer and more delicate lights can be obtained only on matte paper. Carbon print is brilliant in shadows and opaque in lights, for that reason it is possible to obtain the best result for the entire gamut. 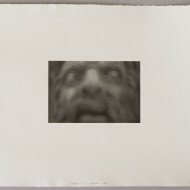 The print is not constituted by a metallic depot (silver, platinum, etc) that penetrates into the fibers of the paper, but by a pigmented, more or less thick gelatin layer fixed on the paper. This augments the micro-contrast and gives the sensation that the picture “comes out” of the paper. 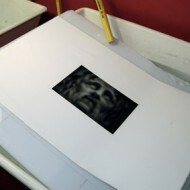 The sensation of a three-dimensional presence is augmented by the fact that the surface of the print is not smooth. The gelatin layer is more thick in shadows and finer in lights. This difference of thickness can be more than 0.3 millimeters and it is perceivable to the naked eye. Almost a century and a half after its invention, all of the characteristics we talked about before made this technique the best one ever. Carbon print is a slow and complex process that requires preparation, dedication and strictness. Moreover, as everything is about gelatin consistency and its power of water absorbance, consistent results arrive only when dark room temperature and humidity are strictly controlled. It is necessary also to control the temperature of every single bath used, with an incertitude generally smaller than 1°C, knowing that different temperatures are necessary for each step of the printing. The choice of the materials is important as well, as the details of the procedure itself. I will also give a describing introduction to carbon print. An interested reader could consult the bibliography at the end of the page or participate to a stage of formation. The final support on which the print will be reported is called “transport paper”. It must be prepared, or sized, with a uniform layer of gelatin whose characteristics such as thickness, bloom degree (the measure of the gelatin hardness), hardening and so on are essential for the final result. The gelatin used for sizing also contains formaldehyde, which disinfects the organic material used in the process, but most of all harden the gelatin layer. This solidification is not immediate; therefore it is necessary to size the paper some days before passing to the real print. In the successive days the “carbon tissue” can be prepared; this is the support on which the pigmented gelatin will be dripped, and will be exposed and transferred on the transport paper. The preparation of a good quality carbon tissue is the most difficult part of the carbon print. Once the carbon tissue is dried (24-48 hours), it is sensitized in an ammonium (or potassium) bi-chromed solution, which is the salt sensible to light, and ammonia, which is useful to control the penetration of the chromo salt inside the gelatin layer and the mechanical properties of this last one. The sensible paper is dried in dark for a determined time and then exposed to contact (that is the negative has the final image dimension) using an ultraviolet light source. During the exposition of the carbon tissue the transport paper must be soaked, because the transfer of the image from one to another is possible only thanks to an exchange of humidity between the layers of gelatin. Once the exposition is over, the carbon tissue is quickly immerged in a basin of water and put in contact with transport paper, handle to eliminate all the bubbles of air and obtain a perfect contact between the supports. Once they are out of the water, they are put under a press. Both papers are put back in hot water. After a couple of minutes it is possible to detach the carbon tissue from the transport paper. And here’s start the development and cleaning phase. It is necessary to continuously shake the basins to detach the gelatin that didn’t hardened during the exposition. In this phase the image finally starts to appear. The development is complete once that, suspending the paper out of the water, there’s no more run-off pigment on the white borders of the print. The developing time can’t be extended as much as one likes (apart from the use of colder water), because after ten minutes gases can form in paper and they can cause the detachment of the gelatin or blistering (micro bubbles). To avoid those problems, once the development has been obtained correctly, the print must be immerged in a basin of cold water that stops completely the developing phase. Then the paper and the borders must be cleaned. When the paper is dried, the image must be treated in a sodium metabisulfite bath that eliminates every single trace of dichromate. After a last drying, there’s the final spotting of the print. All these efforts will be rewarded by magnificent of carbon prints, one of the most beautiful techniques invented during the entire history of the photography. The reader interested to those arguments should read Les procèdès au charbon, by Monckhoven, Lièbert, Colson, Tranchant, Schneeberger, Jean Michel Place editions. Damiano Bianca wrote a good article: “la stampa al carbone, il mito” from which the majority of the information in this article are obtained. Damiano Bianca also organizes carbon print courses and offers a precious carbon print service.